Used on Random Orbital Sanders with Self-Generated Vacuum to collect sanding dust. Eliminates the need for vacuum hose which improves operator ease of use. 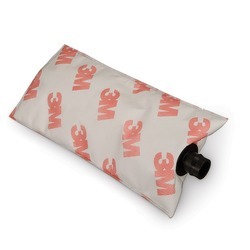 Use with 3M™ Filter Bag Adapter to attach bag to sander. HEPA rated. New construction provides increased dust collection capacity.